What is Promote AZ and How Can I Play A Part? Millions of people choose to live in Arizona or were born here, and stay. The Arizona Commerce Authority wants to know why. It’s part of our statewide initiative to unify Arizona’s message and brand. And we need your help. You may be wondering why we’re doing all this…. Arizona is a wonderful place and it’s time people knew about it. We’re seeking to find what is genuine about this state. What is in the hearts of the people. And not just a few loud people. But ALL the people. Through your heart-felt stories and the love you share we’ll be able to create a unified message and image for the state, attract more visitors and business and grow our economy. That’s good for everyone! And we all play a role. How do the Arizona Technology Council and our members play a role in this? The Council’s signature luncheon in September is presented by the Arizona Commerce Authority, who helms this initiative (with the Governor’s Office). Kathy Heasley, founder and president of HEASLEY&PARTNERS, will cover the goals and process for the project and lead an interactive working session with attendees from the technology industry. This session will uncover feelings and candid feedback about Arizona which will be used in the creation of an identity for the state. 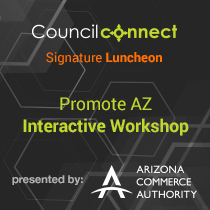 Join AZTC and these important partners and contribute to the growth of Arizona at September’s Council Connect signature luncheon. The event is being held at the Biltmore Fashion Park Blanco Tacos + Tequila on Wednesday, September 30 from 11:30am – 1:30pm. Register in advance: we expect to sell out!